Vaccinium stamineum. M. B. Gargiullo (5/2010). 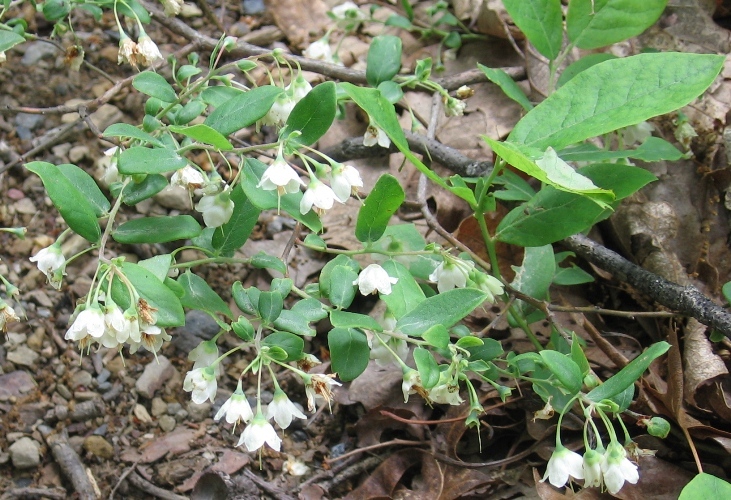 Vaccinium stamineum is a shrub to 1.5 m tall, diffusely branched; young twigs hairy. 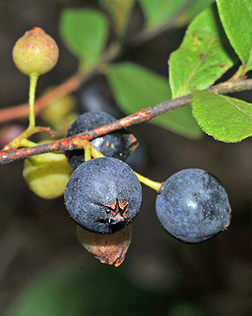 Vaccinium staminium (deerberry). flowers close-up. Matthew Beziat. Native Flora of the Eastern U. S. (5/2017). Leaves alternate, egg-shaped, to 10 cm long, finely hairy, whitish below, margins entire, tip pointed. 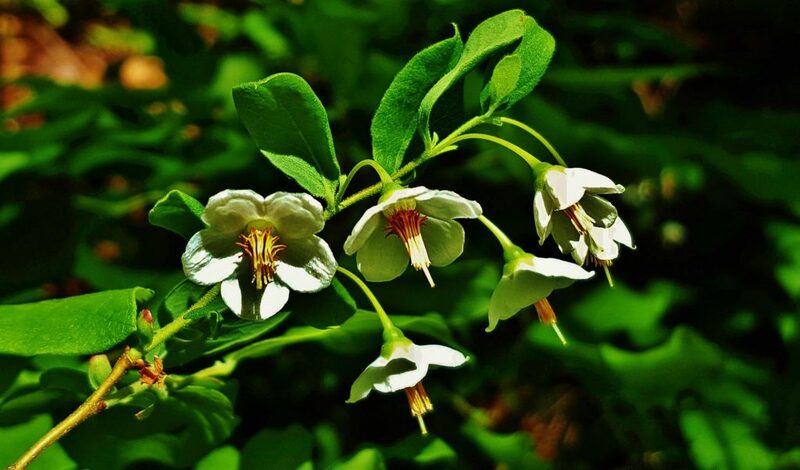 Flowers greenish-white often with purplish caste, 5-lobed, to 0.6 cm, open, petal lobes spreading, stamens longer than petal lobes, flowers drooping on thin stalks, in unbranched clusters amid small, leaf-like bracts to 1 cm; blooms May-June. Vaccinium stamineum fruit.© Copyright 2016, Virginia Tech Dept. of Forest Resources and Environmental Conservation, . dendro.cnre.vt.edu (Accessed 3/2017). Fruit yellowish-green to blue, juicy but hardly edible, dropping early, July-Sept.
Habitat: Dry to moist oak woods, acid soil, pH 4-6.5. Tolerant of shade, drought, salt. Moderately tolerant of soil compaction. Intolerant of flooding (Hightshoe 1988). Host to larvae of the red-spotted purple butterfly, Limenitis arthemis astyanax; (Nymphalidae); (Struttmann 2003; Tallamy 2003).